은 65세 때 초상으로 왼편에 채제공의 자찬문을 이정운(李鼎運 1743- ? )이 썼다. 서양화법을 따른 명암법을 적절히 구사하여 얼굴을 사실적으로 묘사했으며, 장식적인 금관조복을 금박, 선명한 채색, 명암법 등으로 화려하게 표현했다. 사실성과 장식성을 어우러지게 하여 조선 초상화의 뛰어난 수준을 잘 보여준다. 누가 그렸는지 밝혀져 있지 않으나 입체감이 두드러진 안면과 옷주름의 표현, 그리고 바닥의 화문석 표현기법으로 볼 때 이명기가 그렸을 것으로 추정된다. Chae Je-gong (1720-1799) was a renowned civil official of the late-Joseon Dynasty. He faithfully represented the political views of his faction on important issues to recover the honor of Crown Prince Sado, who was unfairly victimized, while playing an instrumental role in King Jeongjo's implementation of his policy of impartiality, by which he accorded equal favor to men of all political stripes in official appointments. 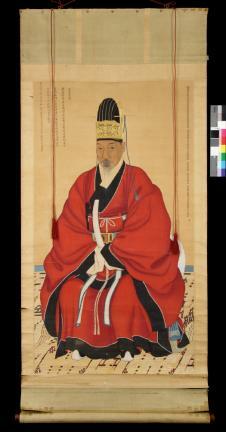 This Portrait of Chae Je-gong in Ceremonial Robe (Treasure No. 1477-2) was painted in 1784, when he was 65 years old. Chae’s poem was written by Lee Jeong-woon (1743~?) on the left-hand side of the portrait. Chae’s face is realistically expressed using the western technique of shading, while his gold cap and court attire are splendidly conveyed with clear colors and shading. This portrait attests to the excellent standard of Joseon portrait techniques, which are harmonized with realistic and decorative features. Although the identity of the artist is unknown, going by the face with its sense of volume and the expression of the clothes’ folds and the figured matt on the floor, it is assumed that Yi Myeong-gi painted this portrait.